Russell Lee’s early works, relaying sensitivity to human plight, socioeconomic dynamics, and the unique representational capabilities of photography, made him an attractive recruit for the New Deal’s Farm Administration Security (1935-1944). 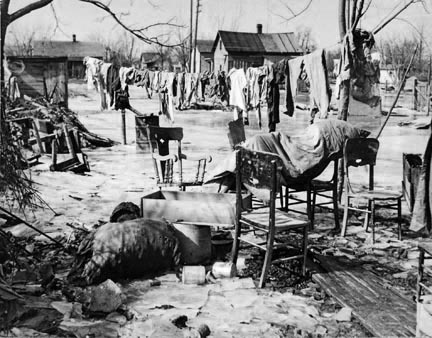 Roy Stryker, head of the Information Division of the FSA (known as the Resettlement Administration until 1937), contracted photographers to garner support for federal aid initiatives by publicizing rural and small town destitution during the Depression in the United States. The photographers employed under the FSA (which also included Charlotte Brooks, Esther Bubley, Marjory Collins, Walker Evans, Dorothea Lange, Jack Delano, Carl Mydans, Gordon Parks, Arthur Rothstein, Ben Shahn, John Vachon, and Marion Post Wolcott) produced images that greatly impacted how both policy-makers and the general public understood the Depression. By addressing public infrastructure and natural disaster with depictions of everyday lives, Lee showed the nation’s complex challenges in a more accessible way. 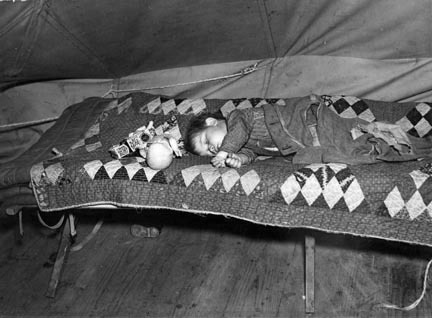 The image, Child flood refugee taking a nap, Tent City near Shawneetown, Illinois (1937) focuses in on a small boy sleeping in a temporary shelter to convey the massive wreckage following the Great Ohio River Flood of 1937. The subject looks just as helpless and innocent as the doll lying beside him. His clean space signals the dignity of this subject and his fellow refugees, while the coat he uses as a blanket and the single shoe underneath his bed points to flood victims’ general lack of resources. These telling details seem all the more poignant because they appear inside the boy’s living quarters. Photographs of interiors were rare at the time since the slow film then demanded additional lighting. Lee’s solution was attaching his camera to a flashgun, which produced harsh areas of light and shadow, while lending scenes a sense of intimacy. Lee’s small and quiet 35mm Contax camera allowed him to get up-close and personal with his subjects. Yet, even before shooting, he often conversed with them and inquired about their daily routines to establish a trusting rapport. Like the portrait of the young refugee, Lumberjacks at dinner. Camp near Effie, Minnesota (1937) suggests Lee’s active involvement with the communities that he photographed. The image shows another high-contrast interior, but, this time, one accommodating a large crew. 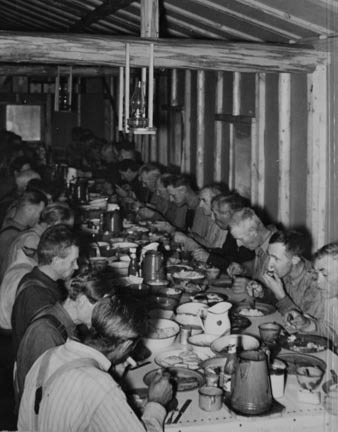 Lee’s long shot and slightly raised angle emphasize the linear formation of lumberjacks seated around a sizable dinner table. From this vantage point, the men’s subtle dining movements seem almost synchronized. Although these Mid-western laborers represent a demographic hard hit by the Great Depression, Lee accentuates their orderliness to imply their work potential and the propriety they share. 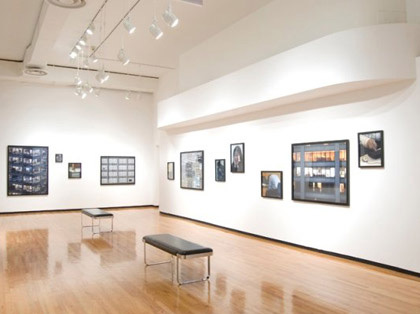 In this regard, Lee’s sympathetic and meticulous work can be considered a model, encouraging Americans from different walks of life to care for one another. Russell Lee was born in 1903 in Ottawa, Illinois. He completed a BA in chemical engineering at Lehigh University, Bethlehem, Pennsylvania (1921). He attended art classes at the California School of Fine Arts in San Francisco (1929-31) and those conducted by John Sloan at the Art Student League in New York (1931-1935). He worked as a photographer for the Air Transport Command (1943); and the United States Department of the Interior (1946-47) among other governmental and commercial organizations. Lee taught at the University of Missouri (1949-62) and the University of Texas at Austin (1965-1973) where he developed a photography program. He is the recipient of a resolution from the Coal Mine Administration (1947); a photojournalism award from the Workshop Directors of the School of Journalism, University of Missouri (1954); and a memorial resolution from the Texas State Senate (1986).